Pompadour Colour Bathroom Products. Toilet Seats. Basins. Pompadour Is A Medium To Dark Pink, With A Hint Of Dark Peach And Grey. Discontinued and Obsolete Bathroom Sanitaryware Products. JSL Bathroom Suites. Bradford. Yorkshire. Low Trade Prices. Pompadour Pink Bathroom Products and Spare Replacement Parts. Low Trade Prices. Toilet Seats. 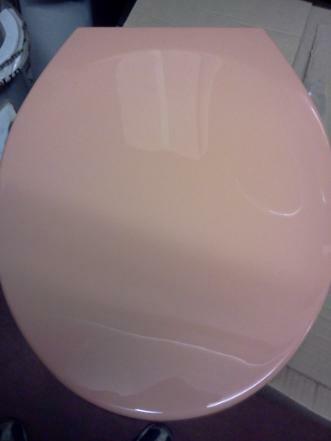 Pompadour Pink Toilet Seats And Bathroom Spare Parts And Replacements. Pictured. Pompadour Colour Standard Shape, Size and Fit Toilet Seat. The Product On This Page Is Meant To Serve As An Illustration Of Its Colour. Pompadour pink.